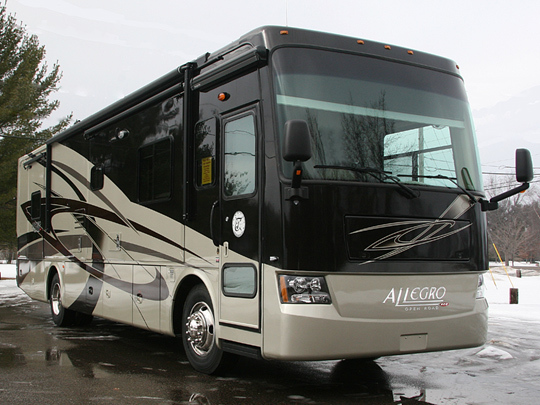 Tiffin Motorhomes recently announced the brand new Allegro "RED" 36QSA. The Allegro line is Tiffin Motorhomes' entry level class but referring to this coach as "entry level" really is a misnomer. The Allegro line may be the entry level to a Tiffin product but it's features place it well above many entry level offerings by other manufacturers. 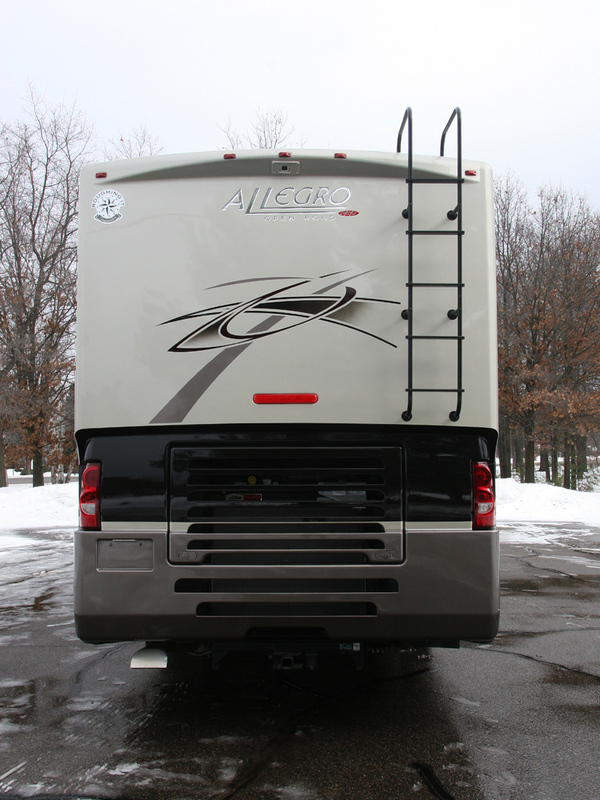 In 2009 the Allegro received a fantastic new full body paint scheme that makes it look much more expensive than what it is when, in reality, the Allegro is a very affordable class A motorhome. What particularly makes this model unique is the fact that it is a rear engine diesel pusher, built on a Freightliner chassis with full air-ride suspension. The marriage of a diesel pusher chassis and the Allegro line marks the first time that a diesel pusher has been offered in the Allegro and now places a diesel pusher chassis firmly into the grasp of many RVers who previously found them beyond their budget. The Allegro RED is a very affordable diesel pusher, and has a few upgraded features not found in the gasoline powered or FRED diesel puller chassis versions. Tiffin Motorhomes has always been known for providing the most "bang for the buck" by providing the most value at any given price point but the Allegro RED really does take that to an even higher level. The next step up the ladder is the Phaeton, which has been the number one selling diesel pusher in this country for a number of years. The Phaeton's huge success was due to it's excellent value to cost ratio. It's hard to improve on perfection but Tiffin Motorhomes has done that by offering the RED at a lower cost than the Phaeton. 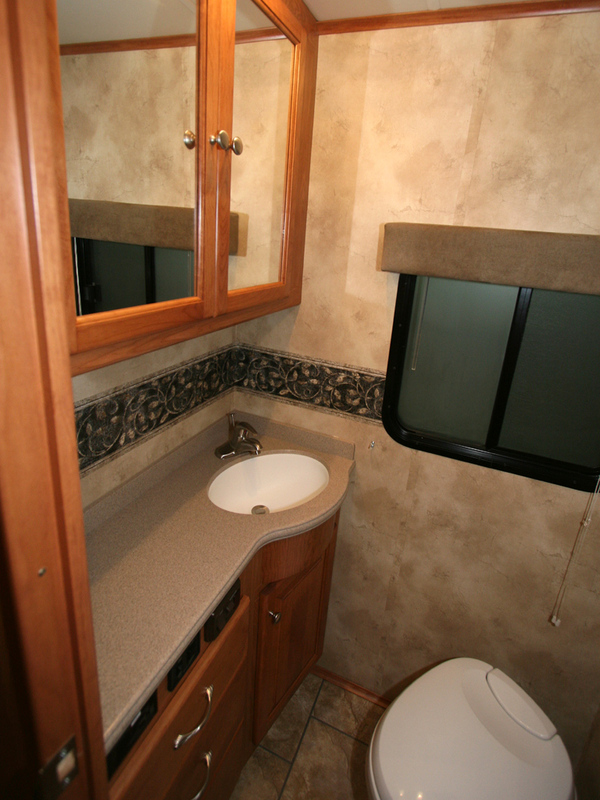 It's difficult to offer a product with a more favorable price point because it's necessary to remove features or amenities but the Allegro RED was a success in that the unit still offers the core items that are needed and desired by the RV community while still being able to employ cost saving measures that really won't impact the enjoyment of this great RV. 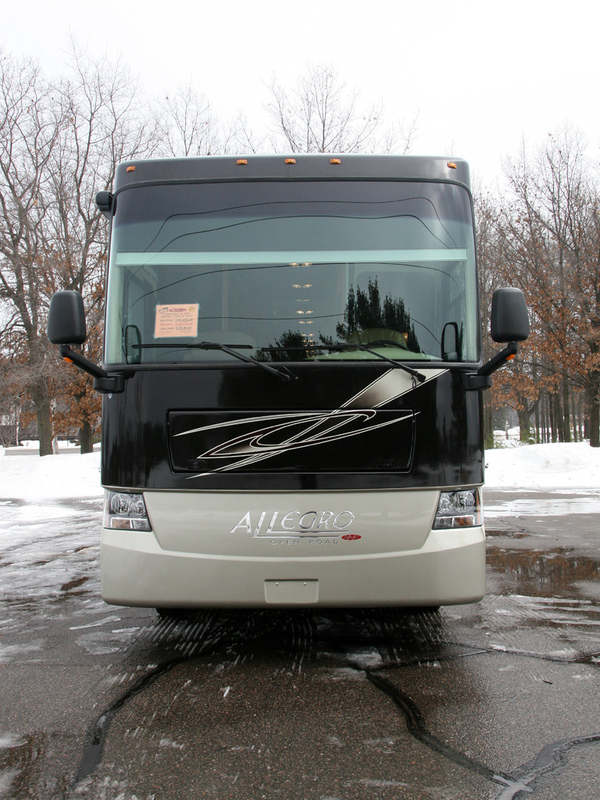 I recently had the fortune to evaluate a 36QSA at King's Campers in Wausau, WI during their annual spring open house and met with Bob Tiffin to discuss this unit, take a test drive in it, and shoot some pictures to share with my fellow members of the TiffinRVNetwork forum. Current pricing on all new Tiffin products can be viewed on my Tiffin Motorhomes Pricing page. The 36QSA that I viewed at King's Campers was in the Mocha Sunlit Sand full body paint color scheme. The above images show the changes made this year to the paint scheme. The 2009 Allegro shows a heavy accent toward black on the front cap as well along the roofline area, giving it a high end look that belies it's purchase price. The interior ceiling height has been increased by 4-5 inches and the ladder is now black anodized aluminum to better blend in with the decor. This coach came with 22.5" steel wheel rims covered by stainless steel trim rings. The Allegro RED comes with a Freightliner chassis and features dash and side console arrangements typical to diesel pushers. 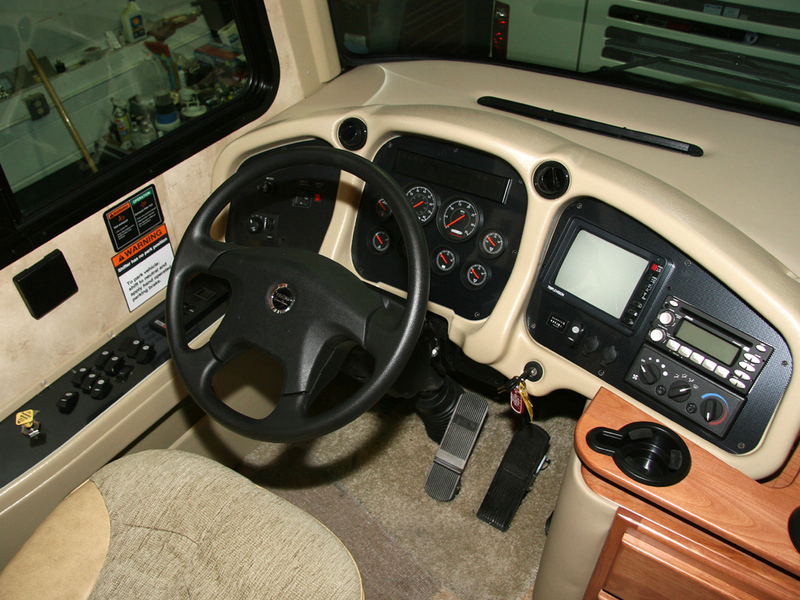 The side console features the usual array of rocker switches to control the various accessories as well as the engine exhaust brake, Allison transmission control keypad, and parking brake control. The steering wheel is tilt-telescopic while the pedals are fixed. Standard Freightliner instrumentation provides information on the usual engine functions as well as air pressure in both forward and rear air tanks. The rear vision monitor displays the view from the rear vision camera as well as dual side mounted cameras that automatically switch whenever the turn signals are operated. The above images show the front entry way. Using a front entry versus a mid entry frees up the sidewall so that couches or other furniture arrangements can be placed there. 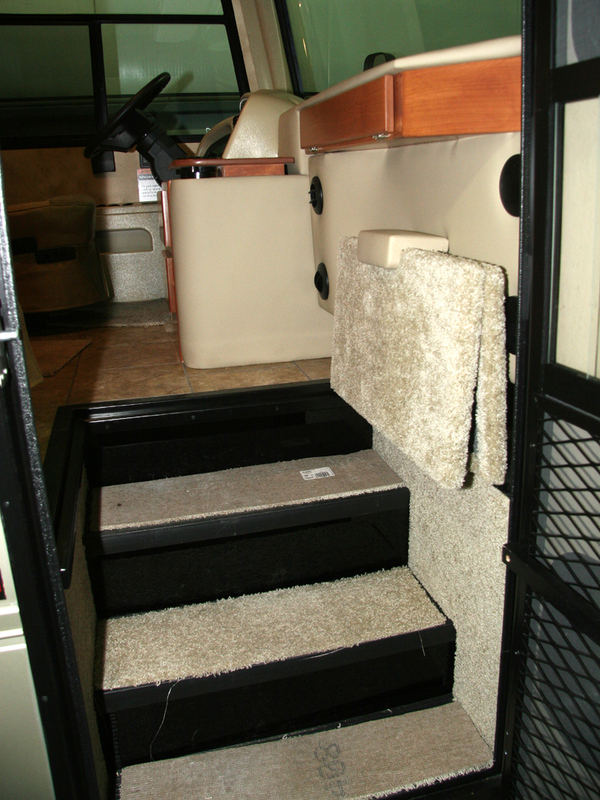 The 32" wide stairwell makes for easy access or egress to or from the coach. 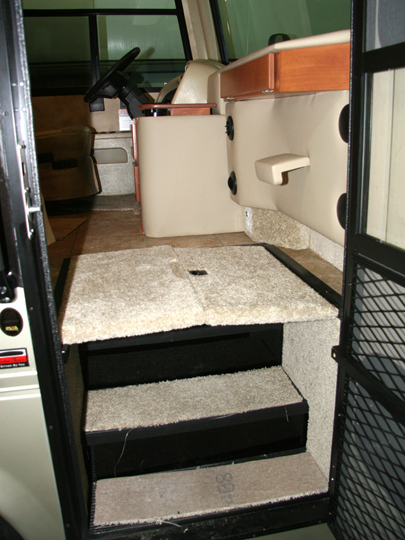 Typical diesel pushers utilize a pneumatic step cover to provide a footrest area for the passenger when traveling. One of the RED's cost saving measures was to use a flip down panel instead of a pneumatic step cover. This design is simple and works very well and is quick and easy to deploy. This floor plan comes standard with a mid-ship mounted TV. 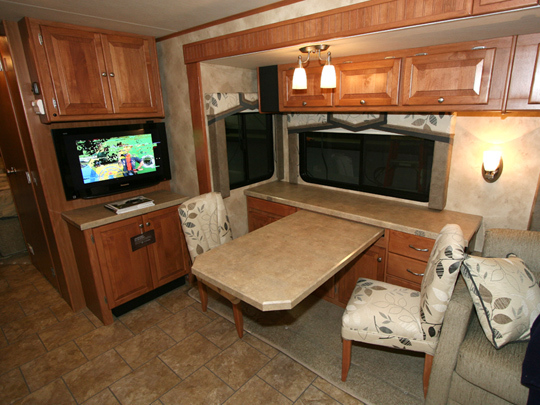 However, an optional LCD TV can also be placed in the overhead cabinetry above the dash area. 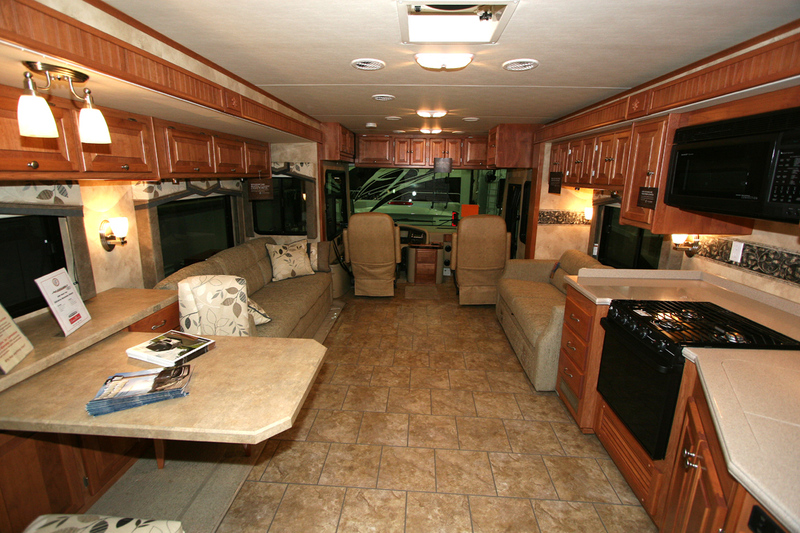 This particular coach came with the standard cabinetry. The RED features a number of amenities not found in the other Allegros. Power MCD Duo privacy/solar shades are found in the windshield while manual MCD Duo shades are found in the cockpit side windows. Pleated shades in the living areas of the coach are gone, replaced by the excellent Roll-Ease dual privacy/solar shades. There are three interior decors available - Matisse, Azure, and Papyrus. This particular coach featured the Matisse interior with Medium Alderwood cabinetry. Natural Maple or Cherry Bark are also available as cabinetry choices. The fully ducted ceiling vents handle the standard dual 13,500 BTU air conditioners and are very quiet in operation. Dual 15,000 BTU air conditioners are available as an option and also feature an upgrade from the standard 6,000 watt Onan Quiet Power generator to an 8,000 watt unit. This view shows the main salon area as looking back from the cockpit. The standard LCD TV is located on the wall at the rear of the main living area. A 62" passenger side couch faces a longer 74" couch on the driver's side. The standard couches fold out into a Hide-a-Bed for additional sleeping space. 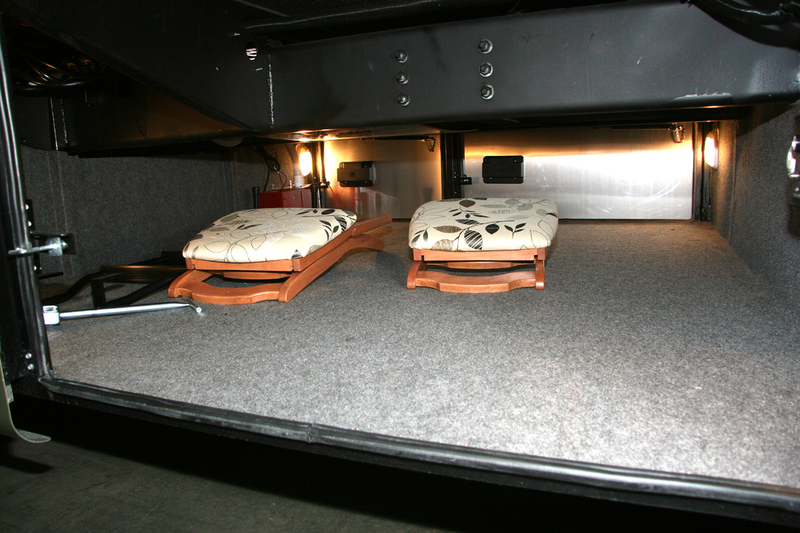 The 62" couch can be ordered in an UltraLeather option and the 74" couch can be ordered as an Air Coil Hide-a-Bed. 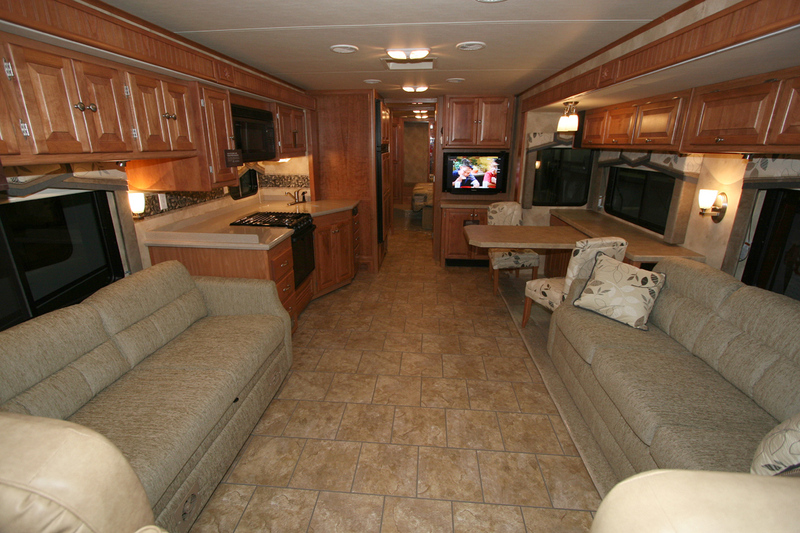 When the quad slides are extended there is more than enough room for comfortable living in this coach. Tiffin Motorhomes has always been known for providing the most cabinetry and storage space in the industry. Some of these cabinets can be seen in the above two views. The standard dinette is a booth style dinette. Optional dinettes include a free standing dinette, or the computer workstation, which is shown here. The computer workstation provides a huge back buffet that can be used for serving dishes when eating, placing a large computer monitor, or anything else that you'd care to place there. The legless table pulls out to allow comfortable seating for four or retracts for travel or when dining for two. On the left side of the cabinetry is a slide-out shelf designed for a printer and scanner and a small laptop computer storage cabinet is also provided. Various other drawers further improve on the RED's already cavernous storage capacity and even provide a drawer for hanging file folders. The standard mid-ship LCD TV is located in the hutch immediately next to the dinette. 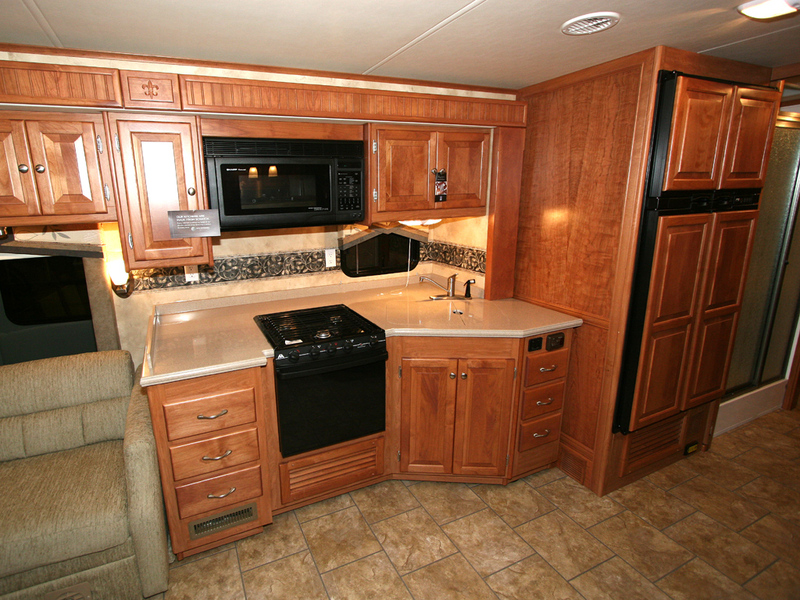 The galley area comes standard with an overhead microwave and a range/oven unit. An option is a convection/microwave oven with a 3 burner cooktop and drawers underneath. The standard refrigerator is a 2 door 10 cu ft Dometic refrigerator capable of running on either 120 volts or propane. Shown here is the optional 12 cu ft Norcold 4 door refrigerator with optional wooden accent panels. The solid surface countertop includes cover panel that convert the sink area into extra counter space. The panels lift off and store in the cabinet directly beneath the sink in a handy storage rack. Directly over the passenger's seat is a cabinet that holds the entertainment system equipment. 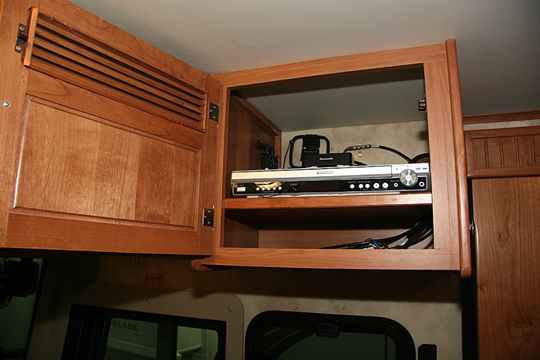 This unit features the optional DVD Player and Surround Sound System. There is plenty of room in this area to add additional components, such as satellite receivers or DVRs. 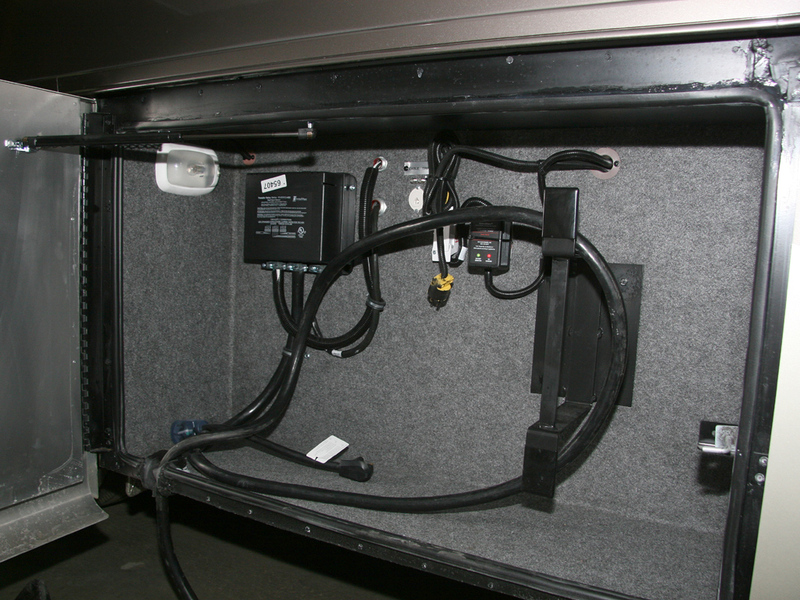 An optional KingDome automatic satellite dome is included on this unit and all of the cabling is run to this area so that you can plug your existing satellite receiver or DVR right in. The louvered panel provides air circulation to keep your electronic equipment cool. 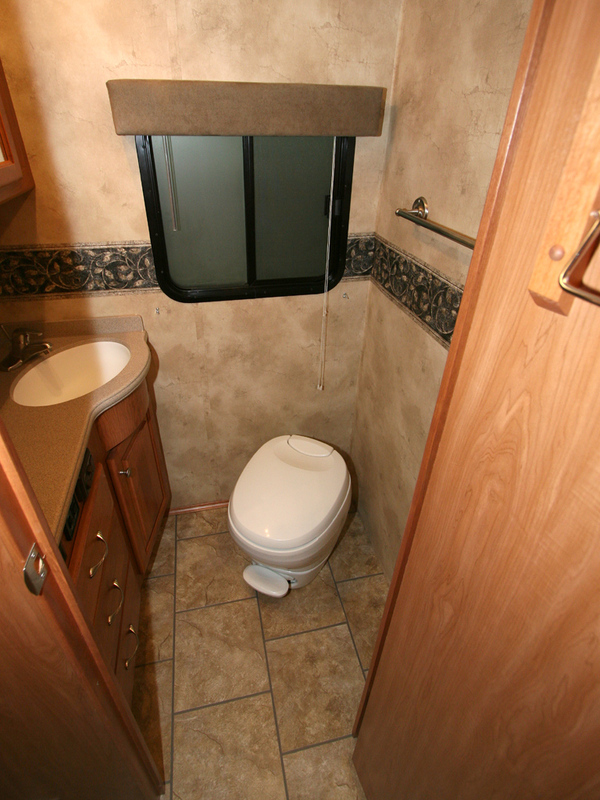 The bathroom is a separate room placed on the driver's side of the coach. It features a foot pedal operated toilet as well as a handy vanity unit with a solid surface top and a flush mounted sink. An overhead medicine cabinet and a ceiling fan complete this area. A 41" rectangular shower stall is located on the passenger side of the coach, immediately opposite the bathroom. This entire bath area can be cordoned off via sliding doors on each end to separate it from both the bedroom and the living area if desired. 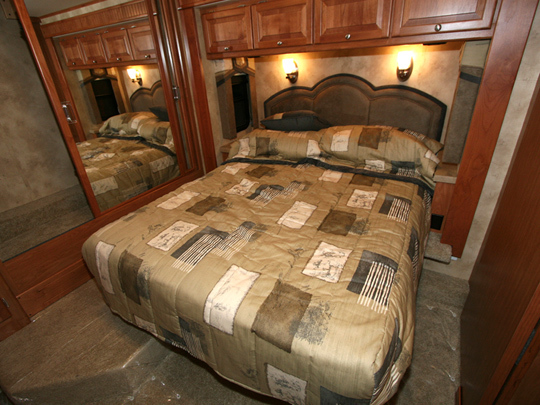 The master bedroom features a standard queen bed with plenty of storage space underneath, located in a slideout. 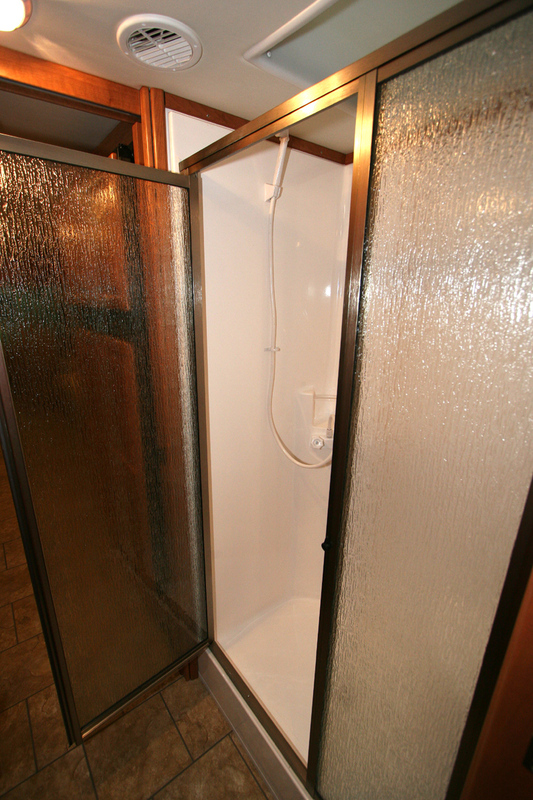 Sliding doors can separate it from the bath area when closed. A wide wardrobe closet with mirrored sliding doors spans the rear of the coach, offering plenty of wardrobe storage space. Located on the passenger's side, at the opposite end of the bedroom, is another slideout. 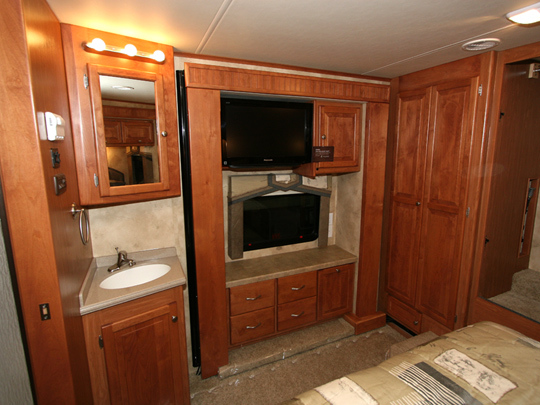 This slideout contains a standard LCD TV, additional cabinetry, a laundry hamper, and a vanity counter. In the rear of the coach, adjacent to the massive wardrobe, is a large linen closet. This closet is also be used to locate the Splendide combo washer-drier unit, should you choose to select that option. In that case the upper half will remain shelved storage while the washer-drier will occupy the lower half. Also visible is a second bathroom sink, vanity, and medicine cabinet. This is located in the bedroom area and will be separated from the bath area should the sliding privacy door be closed. One of the big advantages of any diesel pusher chassis is the raised rail frame construction. This design gives the ability to incorporate a large pass through storage space, unavailable in a FRED or any gasoline powered chassis with standard frame rails. The Allegro RED features side hinged doors and also incorporates the passenger side slideout mechanisms in the side of the slideouts. This removes the slide out mechanisms from the basement area and offers unparalleled storage room and ease of access. Shown in this image are the two folding chairs that expand the dinette seating to accommodate four persons. 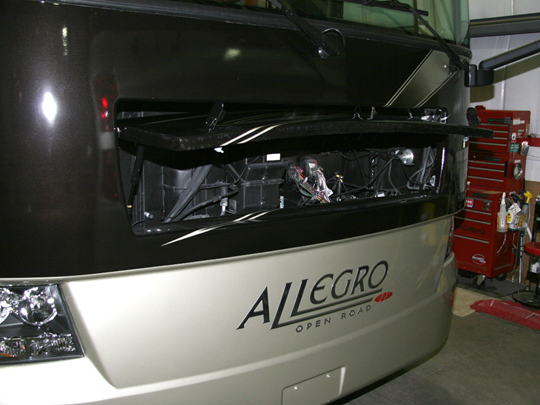 The four coach batteries, junction connections, and battery disconnect switch are located in the curbside compartment immediately aft of the rear axle. 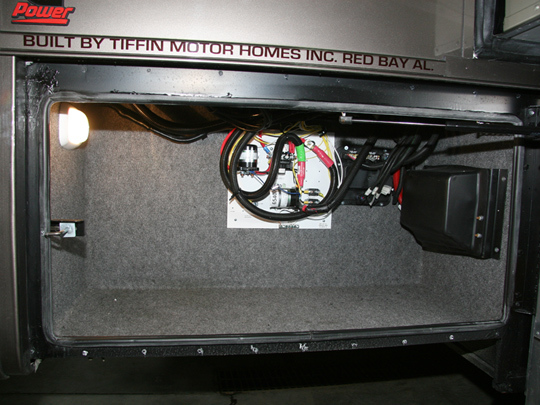 A lined storage compartment is also included for misc storage. Not shown in there images is the propane tank, which is located immediately aft of the front axle on the passenger's side. That location makes it perfect for the addition of an Extend-a-Tee to allow running a portable propane grill from the RV's propane tank if so desired. The rearmost driver side compartment contains the Intellitec automatic transfer switch, a cord winder for the 50 amp shore power cord, cable TV and telephone connection points, and a BatteryMinder pulse type charge which serves as a chassis battery maintainer/charger. 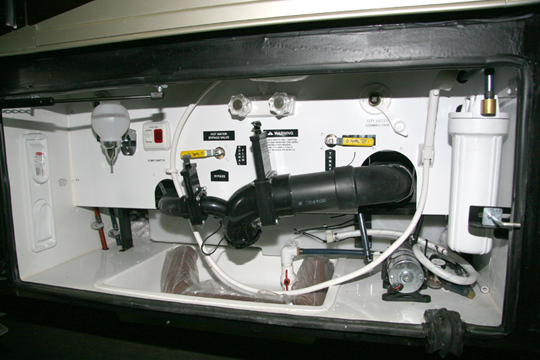 The plumbing service bay, or wet bay, contains a canister type water filter, the water pump, a soap dispenser, an exterior shower attachment, black and gray tank dump valves, and the various water connections and controls to operate the plumbing features on this coach. A paper towel dispenser is located vertically on the left side of the compartment. The frontmost driver side compartment is always reserved for electrical components on diesel pushers due to it's proximity to the dash area. 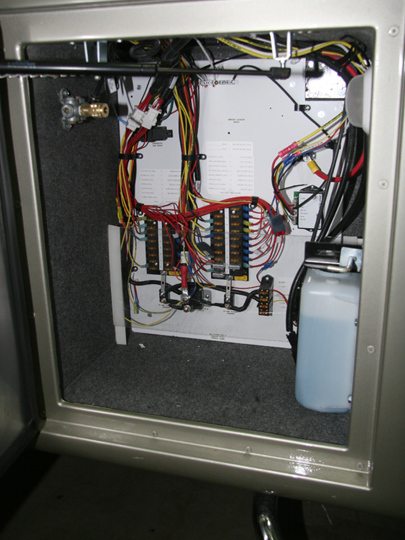 The various 12 volt fuse panels are found here along with other electrical components. The windshield washer reservoir is found on the right and an auxiliary air supply quick disconnect fitting is found on the left and can be used to air up tires or run pneumatic tools. There's still plenty of storage space in here for two gallon jugs of windshield washer fluid as well as an air hose. 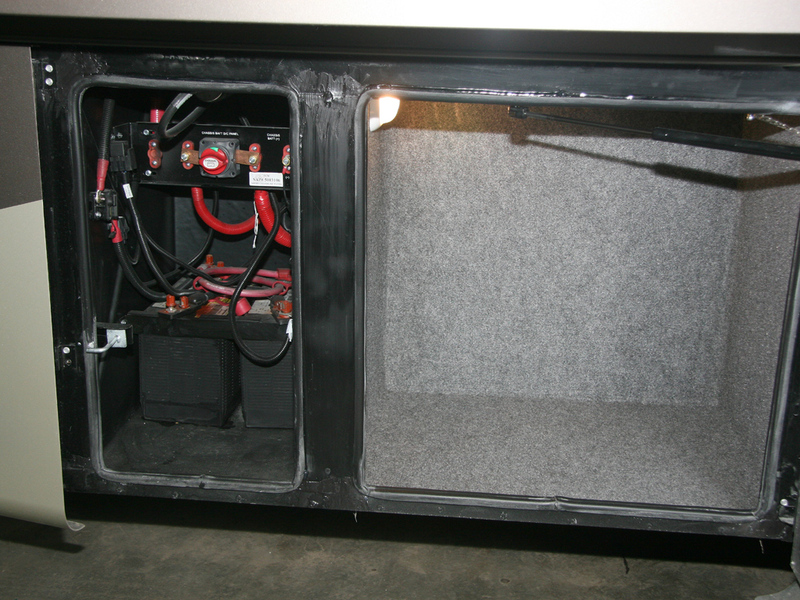 The Allegro RED comes with a 6,000 watt Onan Quiet Power diesel generator as standard. If ordering the larger 15,000 BTU air conditioners an 8,000 watt unit will be supplied. One of the cost saving measures on the RED was to eliminate the generator's slide out rail mechanism used on the Phaeton and Allegro Bus. Normal service access is provided via the flip-up hatch cover in the front cap. Should major repair be required the generator set would have to be dropped down on a jack rather than slide out the front. The Allegro RED comes on a Freightliner XCR chassis featuring a rear engine, rear radiator, air-ride suspension, diesel engine design. It's a totally new offering in the Tiffin lineup and is designed to place a diesel pusher in a price range not before possible, yet still retaining the features needed and desired by RVers to make this an attractive and workable configuration. The RED (Rear Engine Diesel) is powered by an economical 6.7 liter Cummins ISB engine that cranks out 340 HP and 660 ft-lbs of torque. It's coupled to an Allison 2500 six speed automatic transmission. It features a wide track I-beam solid front axle, full drum style air brakes, Neway air ride suspension, and a 100 gallon fuel tank. The RED has a Gross Vehicle Weight Rating (GVWR) of 29,500 lbs and a Gross Combined Weight Rating (GCWR) rating of 33,000 lbs. In theory that gives you a spread of 3,500 lbs for towing, between the GVWR and GCWR. But, that is assuming that you are loading this coach up to it's full GVWR. The Cargo Carrying Capacity (CCC) for the coach I looked at was placarded at in excess of 4,000 lbs. Past experience has shown me that you won't be carrying that much cargo. I've reached that in our 40' Allegro Bus and we pack extremely heavy. A more realistic figure would be around 3,000 lbs of actual cargo used. Therefore, your true towing capacity will be in the area of 4,500 lbs. If you need more than that, the Phaeton has a towing capacity of a true 10,000 lbs. While the Allegro RED does indeed come with a beefy 10,000 lb trailer hitch, the Allison 2500 transmission isn't rated as high as the Allison 3000 used in the Phaeton and Allegro Bus and is the limiting factor. However, the RED is designed to be affordable and replacing the Allison 2500 with an Allison 3000 would add $6,000 to the price. Adding all of those features basically turns it into a Phaeton, and prices it at that same level, which would defeat the purpose of the market segment that the RED is designed to fill. The 2009 Allegro 36QSA is the first offering of an affordable diesel pusher in the Allegro line. It achieves an excellent ratio of features versus price while not really sacrificing a whole lot of stuff. An upcoming floorplan is a 38' bunk bed version which will add to this line so, while the economy is down at the moment, Tiffin Motorhomes isn't resting on it's laurels and is continuing to invest in new engineering ideas. I had the privilege of going on a test drive with this unit and have to admit that this coach really drives nice. With the diesel engine in the rear it's very quiet drive up front. My initial preconception was that the smaller engine would make this a slower coach than the larger engine Phaetons and Allegro Busses. But, that 340 HP Cummins really did launch the coach nicely and we were able to move out quite quickly. It was very smooth in shifting and power transmission and the brakes were strong and brought the coach to a stop quite smartly. It was nimble and quick and the air-ride suspension handled far better than any gasser or FRED chassis with leaf springs yet floated over the bumps with ease and offered a very comfortable drive. My advice to any prospective customers is to take one for a test drive and compare. That's the best way to truly experience the difference. The Allegro RED is designed to help bridge the price gap between a gasoline powered class A or FRED and the more expensive diesel pushers. As such it seems to have really hit the target on the bullseye. 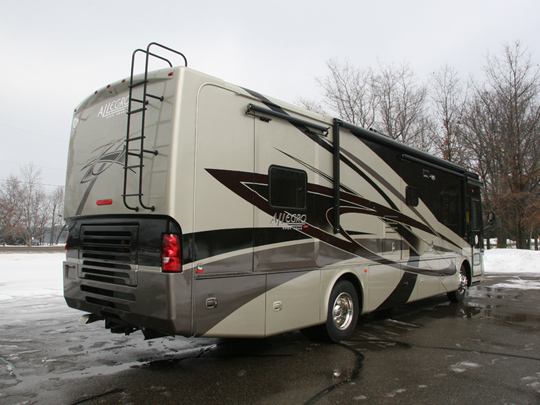 This is a very attractive motorhome, with capabilities and performance that are impressive, making it a very attractive coach at an affordable price. For complete chassis specs visit the RV Tech Library and call up the 2009 Allegro RED Chassis Spec Sheet for more details. Pricing details can be found at pricing.php. and a summary listing of all the new upgraded features found on the Allegro RED compared to the front engined Allegros can be found at RED_features.pdf. In addition a prototype floor plan drawing of the upcoming 38' RED with bunk beds can be found at This Link.